This is College Physics Answers with Shaun Dychko. We have a tube with a fundamental frequency of 32 hertz and our job is to figure out what’s the frequency of first three overtones will be and so the first three overtones are going to be the first three harmonics that exist above the first harmonic, the first harmonic being the fundamental and in a tube is closed at one end which is how we model this tube how we are told. The even harmonics don’t exist so the first overtone will be the first odd harmonic f three<\i> above the fundamental and then we want f three<\i> f five<\i> f seven<\i>. So, I’m just driving a formula here, a closed tube at one end is going to of a resonance wavelength equal to four times the length of the tube and because this is quarter of a wavelength, it also say lambda<\i> over four equals the length, which in this case multiply both sides by four and we end up with this, lambda<\i> equals four L<\i> and knowing that wave speed is frequency times lambda<\i>, we can solve for f<\i> by dividing both sides by lambda<\i> and you get f<\i> is v<\i> over lambda<\i> and so f one<\i>, this is lambda one<\i> over here. The first harmonic is going to be v<\i> divided by four L<\i> because that’s what the wavelength is in this case. Now, the next possible wavelength of three quarters of a wavelength fitting inside this tube because you have to have a displacement anti-node at the open end of the tube and node at this end. 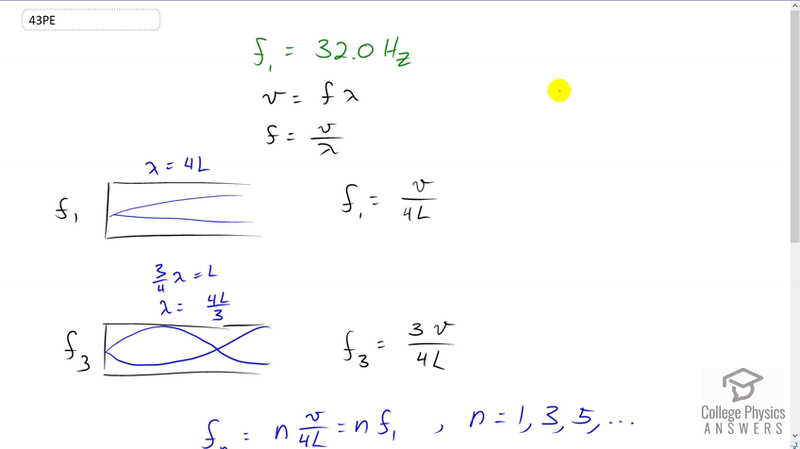 So, the next way to happen to have three quarters of wavelength fit in there, in which case lambda<\i> is four L<\i> over three and so taking v<\i> divided by four L<\i> over three is same as multiplying by the reciprocal of that three over four L<\i> and so we have f three<\i> is three v<\i> over four L<\i> which is three times f one<\i> and so we see the pattern here that the nth harmonic is going to be some integer multiplied by the first harmonic provided the integer is one, three, five and so on. So, we are told that the fundamental in this case is 32 hertz and so we have the first overtone is the third harmonic so that’s three times 32 hertz that’s 96 hertz and the second overtone is the fifth harmonic which is five time 32 or 160 hertz and then the third overtone is seven times 32 which is 224 hertz.